Sarah and I set out this morning for a full day at Carowinds. As soon as we arrived in the parking lot, we knew it was going to be a very hot and humid day. By the afternoon it was 99. Each time we finished a ride, we didn't ask ourselves which ride was next, we asked where is the closest drink of water. 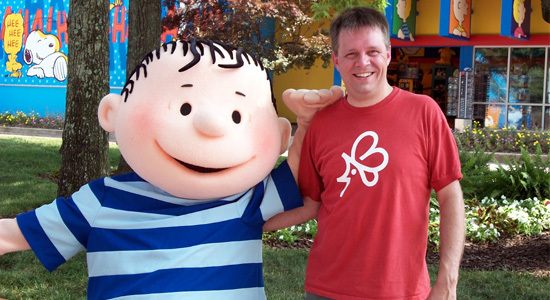 Linus and me at Planet Snoopy. During the day we rode Intimidator several times and also hit SpongeBob 3D in the Action Theatre, Boo Blasters on Boo Hill, Carolina Skytower, Drop Tower, Afterburn, Carolina Cobra, Carolina Cyclone, Carolina Goldrusher, Hurler and Nighthawk. I took solo laps on Ricochet and Thunder Road. For lunch we both had chicken strips, fries and a Coke at Wings Restaurant. It was just average food with buffet style service and poor air conditioning, all for inflated price of twenty-nine dollars. We took in the Snoopy Rocks! On Ice in the Carowinds Theatre. It was a good live show. And the air conditioning is always a plus. Sarah and I finished our day at Carowinds in the front row of Intimidator. Another great day of roller coaster fun in the deep south. Check out all of my Intimidator pictures.